Spoil mom this Mother's Day with Macarons inspired by French Pastry Chef, Francois Payard. A 3rd generation pastry chef renowned for his Macarons, the traditional French pastry that combines crunchy meringue layers sandwiching a creamy ganache or fruit jam, Payard has created a DIY Macaron making kit. Making French Macarons can be a challenge but Payard's kit includes everything you need to make impressive Macarons at home, every time. The fun thing about Macarons is that the flavor possibilities are endless. Over the years Payard has made just about every flavor combination you can think of, but when I reached out on twitter he admitted to liking raspberry the best. So I decided that was the flavor I would try. I used the basic raspberry ganache recipe that came with the kit but changed the white chocolate to dark. You could easily substitute your favorite raspberry jam for the ganache. Be forewarned, the recipe makes a lot of cookies, though that isn't a bad thing when it comes to Macarons. Spoon the ganache into a small pastry bag fitted with a 1/4-inch tip. Alternatively, use a resealable sturdy plastic bag and snip off a corner. Pipe the filling onto the flat sides of half of the meringues. Top with the remaining meringues and serve. Place chocolate in a bowl & set aside. Bring heavy cream and raspberries to a boil. Remove from heat, cover and let infuse for 2 minutes. Pour raspberry cream over dark chocolate and whisk until smooth. Let cool 2 hours or overnight. These macarons are so pretty looking! Love the chocolate raspberry combo. 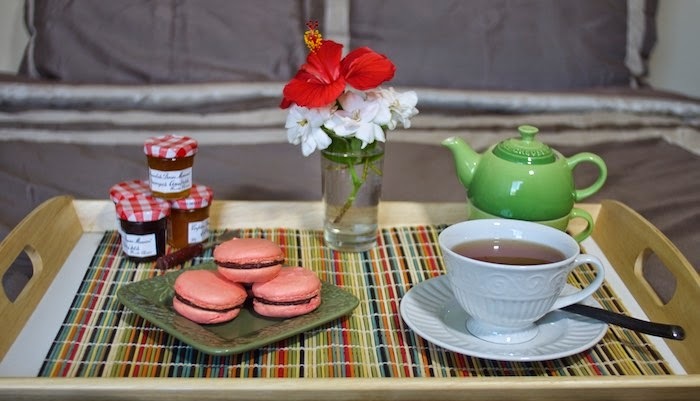 I adore macarons (and a good cup of tea) and how fun that Francois Payard as put out a macron kit! Such a great recipe for Mother's Day! They look pretty perfect and what a perfect idea for Mother's day! Those raspberry chocolate macaroons sound amazing. Perfect with my morning tea! Great job on the macarons! I've only tried making them once and failed miserably! Time to try again! I adore macarons! I spend the month of December making all different kinds and giving them away to friends and family in pretty little gift boxes. I need to try this chocolate raspberry version! Dark chocolate and raspberry are a perfect combination. I know some ladies that would be thrilled to receive this gorgeous macarons set. So lovely!! These Chocolate Macaroons look so delicious. Those look perfect for Mother's Day, yum! Oh, these look perfect! I love the raspberry chocolate combo. Perfect looking macarons! I love Payard's pastry shop, always a treat to go. gorgous! I can never get my "feet" right so I kind of gave up on macarons! I've totally been in love with Macarons for the past few years and yours look fantastic! So pretty! I think I'm the only person in the world that hasn't made Macarons. I really need to change that. Your chocolate raspberry ones look wonderful! I'm sure my mother would love this special treat! Especially the chocolate-raspberry pairing. YUM! Wow! There's a kit to make macarons?! Sign me up. Payard is the godfather of pastry, so I'm totally in.